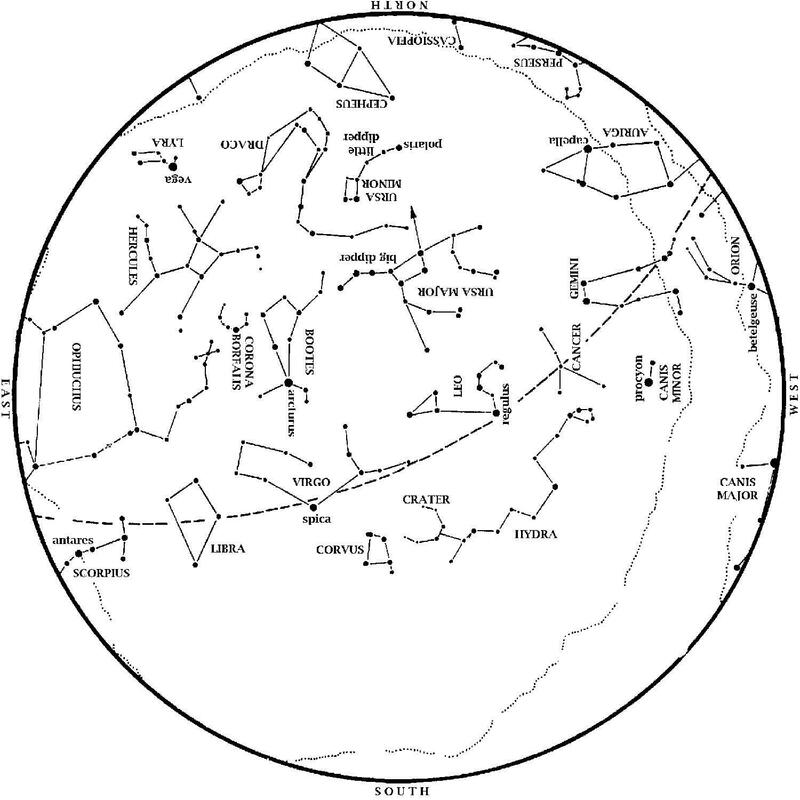 This star map shows the Houston sky at 10 p.m. CDT on May 1, 9 p.m. CDT on May 15, and dusk on May 31. To use the map, put the direction you are facing at the bottom. Jupiter sets in the west in Gemini, the Twins. The Big Dipper is as high as it gets in the north. Leo, the Lion, is almost overhead at dusk. From the Big Dipper’s handle, arc to Arcturus and then speed on to Spica in the southeast. Saturn is below Spica in Libra. Vega and Antares peek above the horizon, announcing the approaching summer. Jupiter remains well placed for evening observing all spring. Look for it in the west at dusk, outshining all the stars we ever see at night. Mercury appears in the evening sky this month. Too close to the Sun to observe on May 1, Mercury gradually comes from behind the Sun and by mid-month, it appears low on the western horizon at dusk right above the point of sunset. Greatest elongation (apparent distance from Mercury to the Sun) is on May 25. Mars is in the southeast at dusk this month. On April 8, Earth passed between the Sun and Mars. Mars has dimmed a little since then as Earth has begun to leave it behind. Still, Mars rivals the brightest stars we see at night. Saturn is up all night long this month. On May 10, Earth passes between the Sun and Saturn, putting Saturn at opposition. That night, Saturn rises at sundown and sets at sunrise. Thus, Saturn is very low in the southeast at dusk, and very low in the southwest at sunup. Venus remains in the morning sky. Look east at dawn for the brightest point of light there; only the Sun and Moon outshine Venus. Venus remains a morning star for almost all of 2014. A swath of brilliant winter stars sets in the west at dusk. Orion, the Hunter, is still visible in the west as May begins. His two dogs, represented by Sirius and Procyon, are to his left. Gemini, the Twins, are above Orion. The Big Dipper is above the North Star, with its handle pointing to the right. From that handle, you can ‘arc to Arcturus’ and then ‘speed on to Spica’; those stars are in the east and southeast at dusk. Leo, the Lion, passes almost overhead in late evening. As Orion and Taurus set, look for Antares, brightest star of Scorpius, the Scorpion, to rise in the southeast. At the same time, Vega, brightest star of the Summer Triangle, appears low in the northeast. These stars remind us that summer is on the way.